Late winter is typically the best time of the year to prune your properties plant life. Although winter is the dormant season for many plant species, it does not mean you should neglect your landscape this time of the year! This is where many homeowners go wrong. There are plenty of landscaping steps that you can take during the winter months to get the most out of your property. Keep reading and discover a few important landscape tips that you can utilize this winter season! If you are looking for a way to enhance the appearance of your landscape this winter, try planting a few evergreens! In addition to green, they can be found in shades of yellows and blues. Evergreens are often the perfect additions to a new plant bed. Not only do they great during the winter months, but they maintain their appearance all year long! We can generally expect at least a few snowy and icy days during in Maryland and surrounding states during winter. In order to protect your property’s plant life, you may want to think about tying branches together to protect them from the weight of any snow accumulation. Another step you could take would be to wrap the base of young trees with wire mesh. When it does snow, be sure to spend some time brushing snow from plants and gently shaking tree limbs. As stated earlier, winter is the dormant season for most species of trees and shrubs. For that reason, late winter is typically the best time of the year to prune your properties plant life. 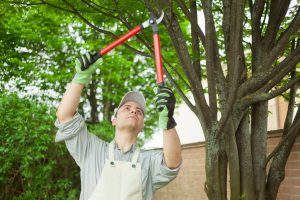 This will help to reinvigorate your trees and shrubs and only allow a brief period before there is new growth in the spring season. Mulch is a landscaper’s best friend during the winter season. If you have ever wondered when is a good time of the year to apply mulch about your trees, shrubs, and plants, now is an excellent time to do so! This help to protect plant roots, as well as prevent erosion. A two-inch layer of mulch will help to keep the ground warm so your plant life can endure the cold winter months. For whatever reason, people seem to think that hardscaping can only be done during the spring or summer months of the year. Winter is the perfect time to hardscape an area of your property! A patio, furniture, gravel paths, or a fire pit could be the focal point that your yard is missing! This entry was posted on Saturday, December 1st, 2018 at 4:47 pm. Both comments and pings are currently closed.